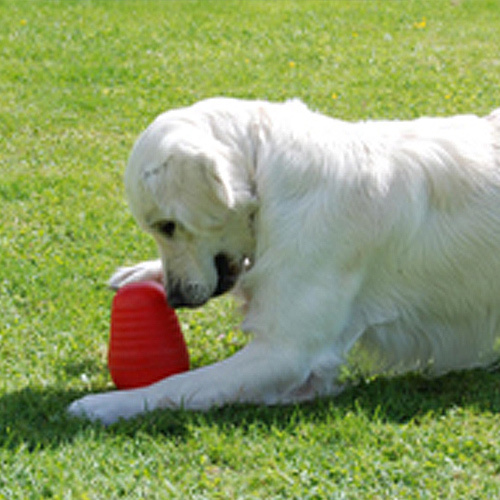 Keep your dog entertained with this wobbly, unpredictable treat releasing toy. Looking for an enrichment toy which will keep your dog's brain firing while feeding? The Nina Ottosson Dog Pyramid is a great choice. Fill it up with treats or food and let the challenge begin. 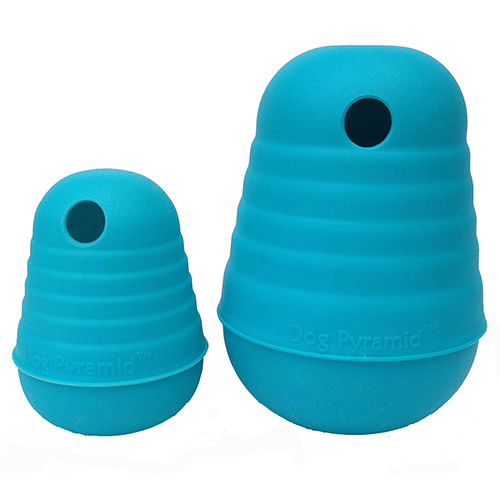 The Dog Pyramid is made from durable plastic. It rocks, wobbles and twists when your dog interacts with it. What sets it apart from other treat dispensing toys is the weighted bottom. The weight in the base makes the Dog Pyramid return to upright after interaction. There's a single dispensing hole at the top which releases the treats. Due to the weighted bottom the release hole always returns to the top. 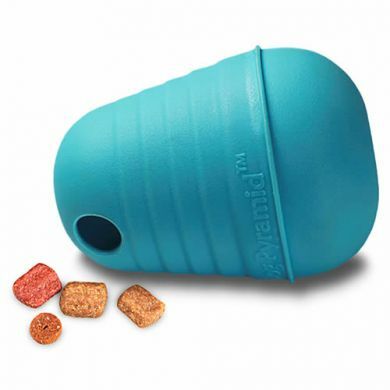 This creates a greater challenge for your dog than treat releasing toys where your dog can just flip the toy so the hole is at the bottom and pour the treats out. Start with small treats for an easier task. Then increase the challenge by introducing larger treats. The Dog Pyramid is designed to be used under your supervision. Do not let your dog bite on the Dog Pyramid as it's not a chew toy. When emptied just stash the Dog Pyramid away until next activity time. Read 3 customer reviews of Nina Ottosson Dog Pyramid. The average customer rating is 4.3. Maple has a lot of fun with this pyramid and it seems quite sturdy. As an 11 week old pup, she has mastered it already and loses interest in favour of her fluffy toy pretty quickly :) Nonetheless it is fun to watch her pounce and bounce it around. very happy with product ,so far it is amusing my dog successfully. This is just the ticket for a bored destroyer,,,my English bull terrier who just loves to tear up my doilies and chew on the furniture and grab my spectacles off the table when no one is looking. This Nina Ottosson keeps her entertained for hours, While she is trying to work out how to break it by picking it up (like her Kong) and throwing it to the grownd repeatedly, this tough pyramid serves as a toy as well as a biscuit dispenser. We just love it.